"Because I have lived both in London and in Toronto for a while, I am well placed to judge some of the differences between these two cities with Tehran. I know that a young girl in Tehran when she leaves home faces a lot more problems than that of a young girl in a city like Toronto. There, a young girl or an elder woman are no different to a man and no one bothers them and the safety level is high. When I say safety, I don't mean the dictionary definition of the word. I think Iran is safe and Tehran compared to other Metropoles is safe too, what I mean is the social safety and the safe keeping of the respect for values. A girl faces much more discourtesy in a city like Tehran than in a city where there is more freedom. I believe making the veil compulsory and the limitations put on women has caused this." The above statement was made by Naeemeh Eshraghi, she is the grand daughter of Ayatollah Khomeini and she said this in an interview with the Jamaran website. 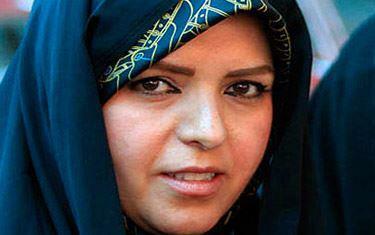 She was 24 years old when Ayatollah Khomeini died. "Yes, I wear the chador, I personally like the chador and have a positive outlook about it, but in truth, I find it difficult. When a woman is is draped from head to toe in black, it isn't visually appealing, it is also very uncomfortable and it can cause accidents for the person wearing it, but chador is the tradition in our household and as the grand daughter of the Imam Khomeini, if I don't do this, I would be breaking the tradition and I don't like this. Also the chador in our household is very symbolic and I don't want to transgress from this. I think if someone is related to a great man like Imam Khomeini, who is known by everyone from the East to the West, the most honourable man I have seen in my lifetime, it creates a commitment in you and this commitment for me could mean doing things contrary to my personal preferences"
Mixed messages. Obviously stuck between a rock and a hard place. However, the fact Khomeini's grand daughter has lived or indeed still lives between Canada and England speaks volumns. After all don't the privileged of the Regime sooner live in these places, only to extoll the hypocritical virtues of the Regime once they find themselves back in Iran? Evidence once again that mere lip service and lip gloss proves the utter failure of this theocratic tyranny!